Our philosophy is keep dental pricing reasonable so you can afford it for your pet's health. Smelly breath can prevent you from sharing a closer bond with your pet. The stink comes from smelly bacteria and tartar build up common on pets who don't have their teeth cleaned. Medical evidence indicates the same bacteria laden tartar can break loose from teeth, migrate to major organs like kidneys or the liver potentially causing more life threatening issues. Regular dental cleaning helps prevent this giving you and your companion more time together with fewer health complications or treatment expenses in the future. Regular cleanings can save you money in the long run. I called ACPH at 6:52pm on Wednesday night (they close at 7pm) when my little pup Olive started looking and acting like she was in pain. Dr. Gerds was pretty sure she knew the problem and asked if I was close and said I could bring her in and they would see her that night. When we got there they did some procedure and gave us the meds my pup needed. I was so thankful they were able to see us so close to closing time! Both Dr. Gerds, Tom and the other staff are always really friendly to our dogs and I think our dogs can tell how much they care for them and all the other animals. The price is fair and pet care is the number one priority. Both my husband and I work during the day so we appreciate having a vet that's open until 7pm and on the weekends. Thanks for all your help! Do you suffer when your teeth are in pain? More than 90 percent of dogs and cats with painful dental problems will not show any signs of being in pain. Sixty percent of dental disease occurs below the gum line. But pain is there. Your pet’s routine exam includes a brief oral exam and when needed, a recommendation is given for how soon a dental cleaning may be needed. Toy breed dogs and cats require dental cleanings at an earlier age and frequently require more frequent cleanings than large breeds. Dental Cleaning (Prophylaxis in "doctor talk"), is a common preventative procedure in dogs and cats. Like us, our pets are susceptible to gingivitis and periodontal disease. Animals feel the same pain of sore gums and a toothache that we feel. One of the main reasons to care for your pet's teeth is to prevent pain. The best plaque defense is regular home tooth brushing in combination with professional scaling and polishing. A thorough physical exam including: coat, skin, ears, joints, heart, lungs and abdominal palpation. This includes a comprehensive internal organ function evaluation and a complete blood count. Organ Function Safety Profile ensures the testing of the organs. A dental cleaning is an anesthetic "event," simply meaning we sedate your pet for the procedure. Your pet receives a quick acting, pre-anesthetic agent, followed by an anesthetic induction with IV Propoflo. Your pet will have an Endotracheal tube placed to provide an unobstructed airway. We use only Sevo gas anesthesia for anesthetic maintenance. It is the same used by human physicians for infants. Your pet is ALWAYS monitored with an EKG and with a pulse oximeter for oxygenation monitoring while under. Vitals are ALWAYS closely monitored: Body Temperature, Heart Rate and Respiration are examples. After completion, your pet is closely monitored during recovery. Our vet tech closly monitors your pet until it is capable of sitting up on its own. Includes tooth by tooth assessment and recording of any abnormalities. Hand scaling including sub-gingival scaling isperformed. Ultrasonic Scaling. Polishing of Teeth. Fluoride treatment. While under anesthesia your pets mouth is checked for any growths or lesions. Our initial consultation will allow us to let you know what is likely to be expected benefits, cost, and specific procedures for your pet as well as prognosis and any risks. If we are able to contact you during the procedure, additional recommended diagnostics or treatments can be performed at the time the problem is found and avoid a second anesthetic procedure. Teeth are either a functional “asset” or a non-functional “liability”. A loose tooth is a painful tooth. Not all teeth are equal. Some pet teeth are more important than others and are sometimes referred to as strategic teeth. Some teeth can be extracted fairly simply and others, such as the carnasal teeth require sectioning of the teeth and creation of a gingival flap, thus cost more to extract. Other teeth, such as the upper canines, require suturing of the open socket area so that communication does not occur up into the sinus area. All sutures are dissolved. A dental x-ray may be recommended. Dental X-Rays can help evaluate structural bone quality, abscesses, tooth remnants, retained or impacted teeth. Oral antibiotics and/or pain medication may be prescribed for your pet. Recommendations and complete instructions and what to be expected after the procedure will be explained and also go home with your pet. Start within a day or two of bringing your new pet home. When playing with your pet do not let your pet nibble at your hand or fingers, even softly in play. Allowing this behavior can lead to aggressive biting as your pet gets older. Pet the muzzle with your finger. Start at the one side of the nose and rub your fingers along the muzzle and whiskers, then work do the same on the other side. This may be as far as you will get the first day or two. Be sure to only go as far as you can successfully. Build on the previous day's success. You may only be able to put your hand on the muzzle the first day or two. This is fine, remember to go slow, make it fun and part of daily play between you and your pet. Use lots of praise and even a treat, if that helps. 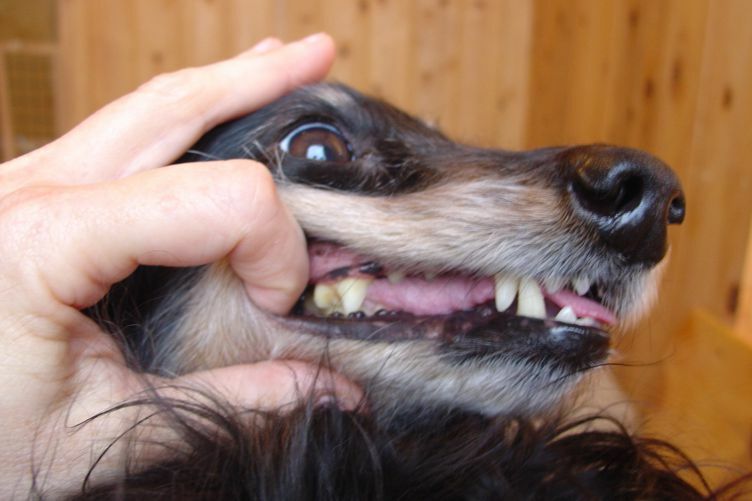 After your pet is used to the top muzzle (maxilla) being handled, start "petting" the bottom muzzle (mandible). Start in the front and rub your finger along each side. Get up close to the lips. If your pet does nibble or nip, stop your "brushing" training and say, "NO!" firmly, then resume the petting gently. It is important to do this every day. Only then will it become a habit and part of your pet's daily life. It is actually easier to do it daily than every other day, or weekly, or monthly. By doing it daily, your pet looks forward to it and will train you to remember it. Some pets actually come running for the attention when they see the toothbrush. 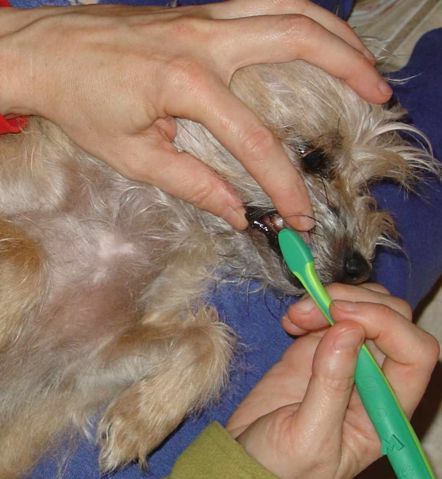 Gradually, you will be able to "pet" the gums with your finger or a soft bristled toothbrush or a finger brush. This should only take 30 seconds. Try to put your finger along the gums to the last molars (below the eye). By 6 months of age, your pet should be so used to having its mouth, teeth, and gums handled that brushing those new white adult teeth will be easy. We have a variety of different types of brushes available. There are traditional small toothbrush types as well as finger brushes that slip over your finger. Use a toothpaste designed for pets. These are flavored to pet’s tastes, fluoride free, and are non-foaming (since pets cannot spit out the paste). Don't use a human toothpaste that contains Xylitol, which is toxic to pets. The baby teeth of puppies and kittens erupt at 3 to 6 weeks of age. Adult teeth replace these by 6 months of age and this will be their final set of teeth. While baby teeth will be replaced by grown up teeth, you want to begin playing with your pet's mouth as part of their basic training. Train your pets so you have the ability to lift up their lips and look at their teeth and gums. By learning to have its muzzle handled when a puppy or kitten, then you will have an easier time when you do need to check your pet’s mouth or brush teeth once your pet has become an adult. Retained or Persistent Deciduous (baby) teeth, also sometimes called supernumerary, is very common in Toy Breed dogs. Puppy baby teeth present at the time of the spay or neuter and if the adult teeth are at least half way in, they should be removed during surgery as there is a chance they will not fall out on their own. Extra teeth in your pet’s mouth can result in misaligned adult teeth and gum disease from the teeth being set tightly together and trapping food and other material. After a professional cleaning is performed, home care plays an important role in maintaining good oral health. Teeth cleaning care at home can be using pet toothpaste and one of several types of pet toothbrushes. Additional options include: oral cleaning/disinfecting dental wipes, drinking water additives, special chew treats or feeding a specific dental diet. All help a great deal. We're always happy to discuss dental care with you and find the best solution for you and your pet.